We were stuck in the doldrums. Drifting aimlessly between breakfast and bedtime, numb hands and mind focused only on my e-mail inbox. For seven weeks, Hadyn and I waited, responded to messages, waited more. The whole of our future hung on the confirmation of a de facto Australian visa, and any ensuing employment. Seven weeks in one of the world’s most impressive tourism destinations, and all I could afford was a feeling of limpid inactivity. Something about the mere word, waiting, can cause us to lose our sense of direction. Especially when it freezes us in a foreign part of the world. And though it’s easy to lose sight of a destination, or a sense of purpose, there’s only one way out of the doldrums: become a tourist again. So this afternoon, I did something I’d missed on all previous visits to Queenstown. Camera held obviously before my right eye, I got lunch from Aggy’s seafood shack. 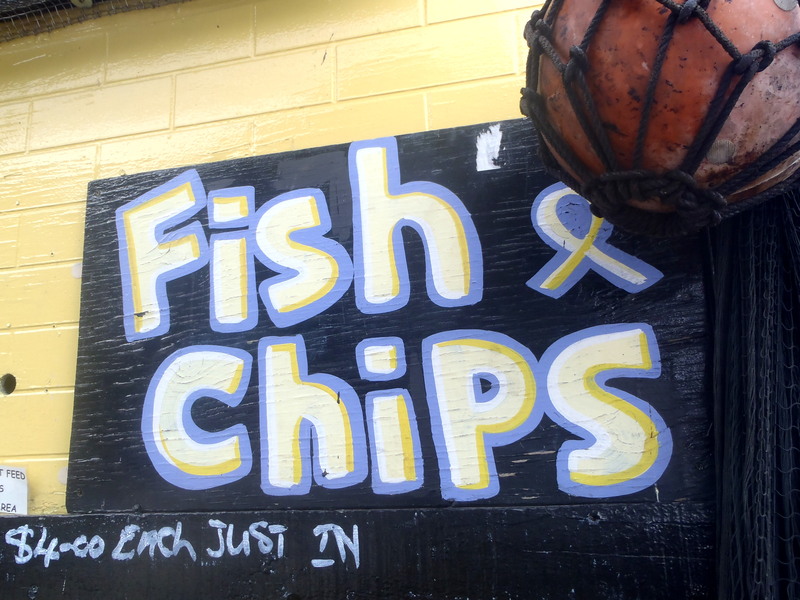 Just plain fish and chips, though the menu’s ‘Wild Foods’ options – muttonbird, abalone patties, kina – tempted. 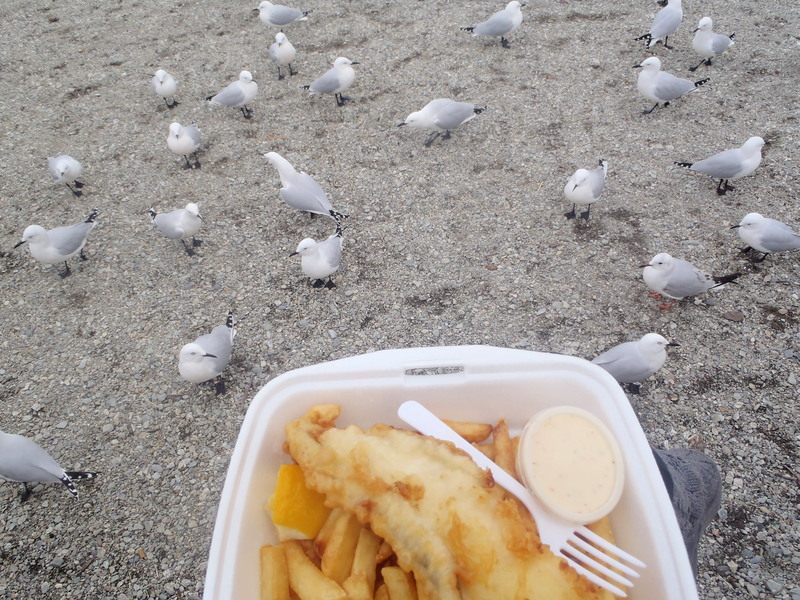 Swarmed by new friends as I defend my lunch on Queentown’s beach. Regardless of the reason – anticipating an extension visa, recovering from food poisoning, preparing for the next outward ferry – you must step out onto familiar surrounds like they’ve never been seen before. Don’t hide your camera like a local, but hang it proudly round your neck and explore the once-boring setting with new eyes. Force a bit of wind in your sails and glide outside your current sticking point. 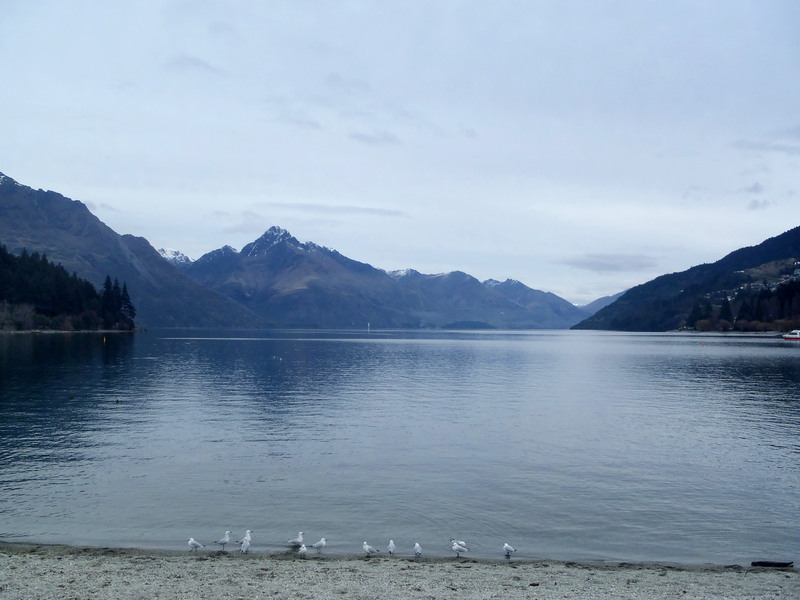 Even under a doldrum-inspired cloudy sky, Lake Wakatipu stretches majestically onward. For more images of the ever-incredible Queenstown, New Zealand, check out the latest album on TooMutchForWord’s Facebook page. Stephanie Yesterday is History, tomorrow is a mystery, today is a gift – that is why they call it the present. I so enjoyed your post! Thank you! Queenstown just moved up 3 destinations !